Select the number of clients and servers you want to protect. When the order is approved you will receive 2 or 3 email confirmations from us depending on if you registered in the shopping cart or not. The last email will be from ESET and will have your user name\password and all the information needed for the anti virus download and the installation of the product. This license will also include free anti virus downloads of the various free updates, upgrades and email support for the length of license purchased. The antivirus solution provided by the Business Edition of NOD32 is sturdy and effective in keeping your computer and network safe and secure from any kind of virus threat. This anti virus download will assure you a virus free computer and a safe environment to work in. ESET Endpoint Antivirus is not practical for businesses with less than 5 computers. To renew NOD32 anti virus for businesses with 1-4 computers please purchase licenses here. For renewals greater than 100 licenses, please contact sales@softwaresecuritysolutions.com for pricing. Should you have a mail server you want to protect in addition to the Enterprise Network, please contact our sales staff at 303.232.9070 or by E-Mail HERE to order the Enterprise Edition with Email Server protection; (It is not included in the above EE). 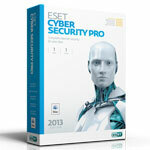 ESET Endpoint Security Business Edition NEW Exchange Server NOT inc.